Don’t get me wrong—I love dolphins and starfish and cute little schools of fishies, but you’ll never see me snorkeling in the ocean. Personally I’d much rather splash around in a man-made swimming pool that lacks the “OMG something just touched my freaking leg” factor. Everyone gets all hyped up about sharks, but in actual fact there should be a Jellyfish Week. Did you know that there are Jellyfish off the coast of Australia smaller than your fingernail that can kill you? 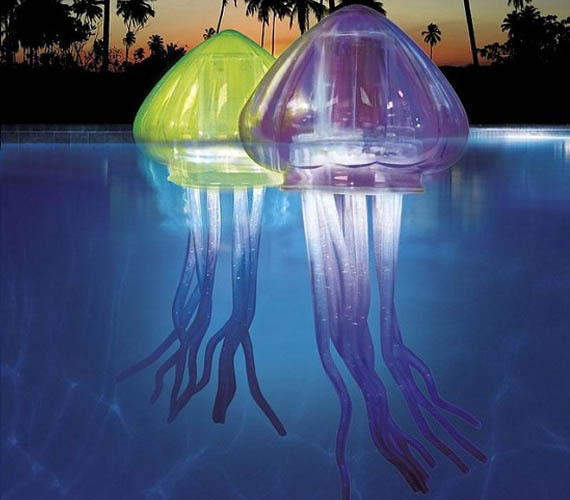 And in Spanish the word for Jellyfish translates to “bad water.” So despite how beautiful these Floating LED Jellyfish would look in your pool, I’m sad to inform you that I will no longer be sneaking in for a late night dip after you fall asleep on the couch watching Jimmy Falon. I’ll just have to check Google Maps satellite photos for a new pool that’s jellyfish free.